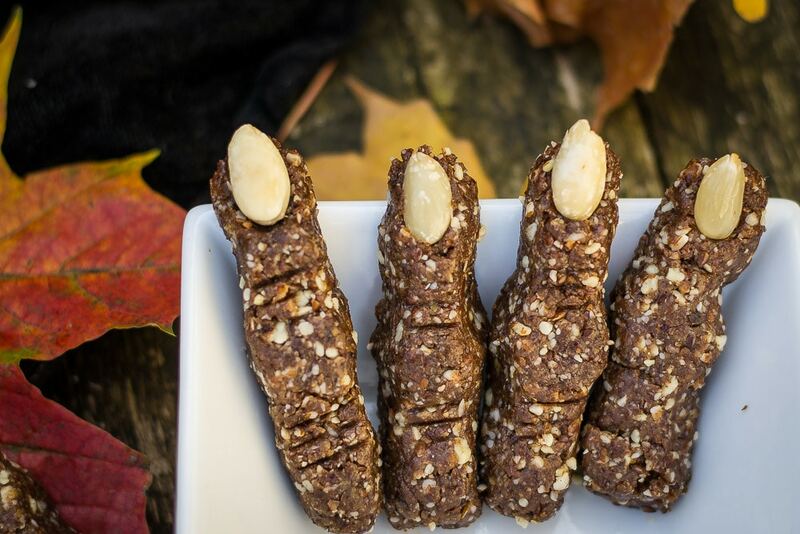 Scary, yummy and healthy Mix Spices and Raisins Raw Monster’s Fingers: your perfect Halloween treat! I didn’t mention Halloween in my post about Autumn when I was talking about all the things I like in this season. Well it isn’t because I don’t enjoy Halloween, but simply because I didn’t grow up with it. In Italy Halloween has started spreading just in the last few years. I actually remember going to a couple of Halloween’s parties when I was a University student, and those were my first – but nothing was on at the commercial level. Now shops, supermarkets, and mass media are definitely embracing Halloween – but it’s still very rare to see in Italy so many and well decorated houses, like here in Ireland. Where we used to live in Italy some of the older kids every year attempt to do some trick or treating, but they do not find often a well prepared neighbor ready with candies!!! My childhood without a proper Halloween might sound depressing to some of you, but we Italian celebrate Carnevale, which – for a kid – has similar aspects to Halloween. When we moved to Ireland Datti was 4, still blossoming with health, and she had experienced the Italian Carnival, which allows you to dress up as you wish. When she experienced Halloween for the first time in her life she enjoyed it straight away, and she also decided that Halloween was reserved to scary costumes only. She wouldn’t accept dressing up, on the 31th of October, as a princess, for example. Now that I think of it she has always wanted to be a witch. 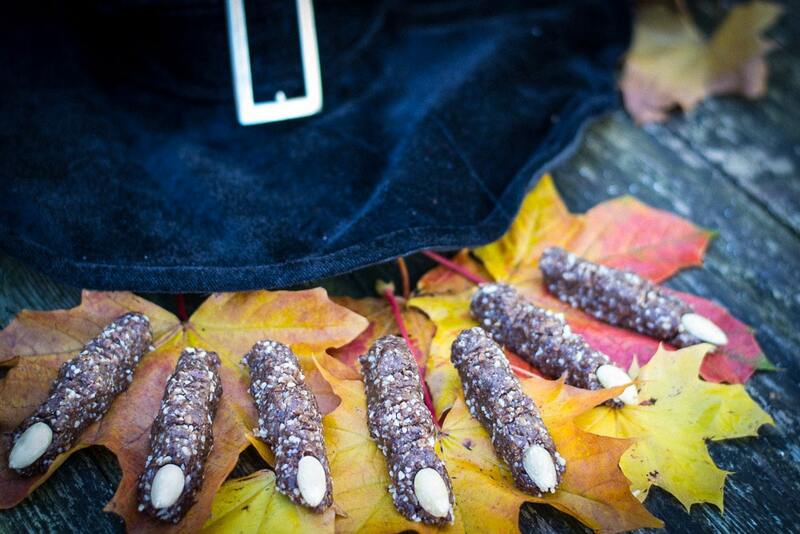 So almost every year I’ve been baking witch’s fingers with a pastry made with butter, egg, sugar and white flour. I brought them to schools, parent and toddler’s groups, and home parties and they were always a hit! My kids ask for them as soon as we get close to the Halloween season. 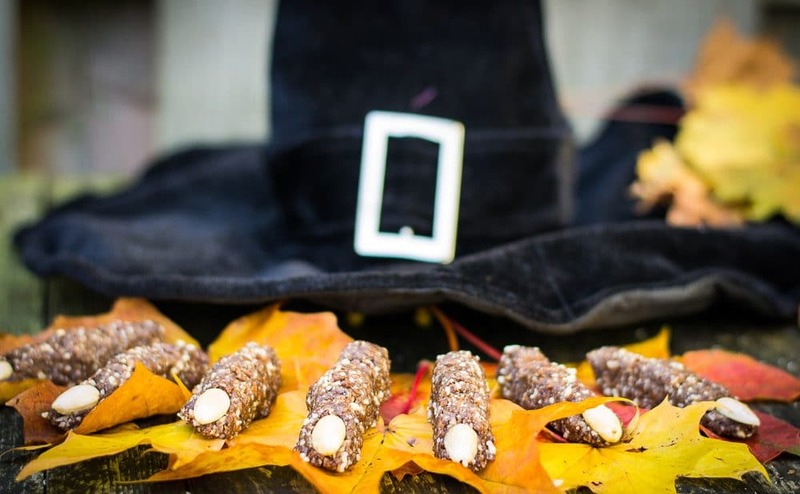 This year I decided to find a different way of making the witch’s fingers. And that’s the origin of my monster’s fingers! 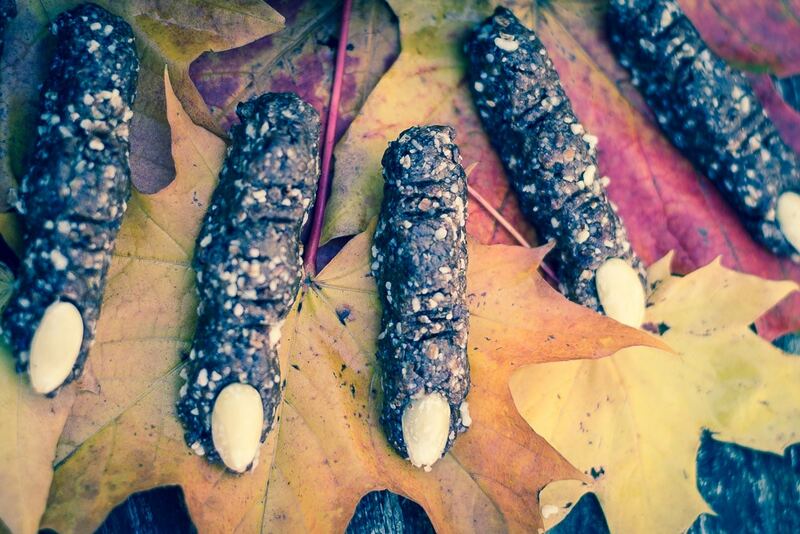 Even if, if you prefer you can still call them witch’s fingers! This reminds me of how, as a kid, I used to do the same for my dad whenever he wanted to bake a cake. I don’t know why, at that time, he bothered with the peeling, when almonds with skin are so much tastier! Anyway I made Mix Spices and Raisins Raw Monster’s Fingers with both white nails (peeled almonds) and brown nails (keeping the almond skin on) and both the versions are pleasant to see! I love the mix spices kick in these Monster’s Fingers and how raisins contribute with a flavour different from the usual dates I’ve been recently using to sweeten treats – and raisins are way cheaper too! Place the 20 almonds in a little bowl and cover them with hot water. 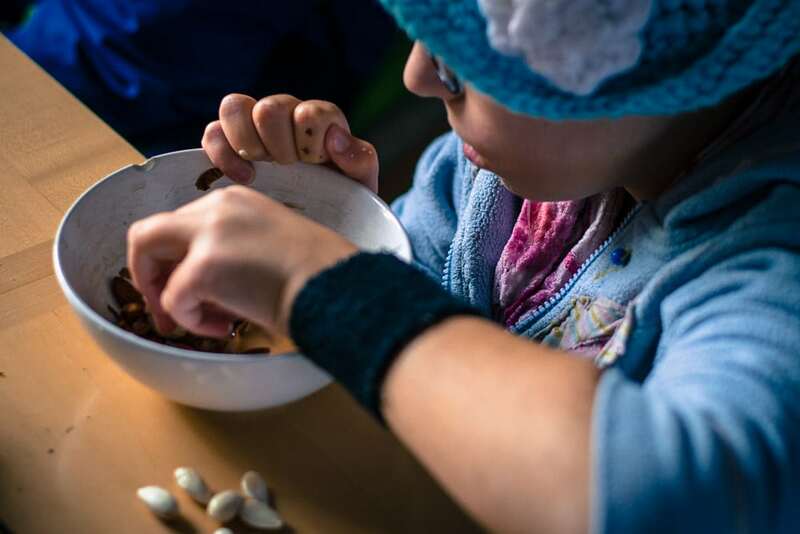 When the water is lukewarm peel the almonds by rubbing them between your fingers. You will now have your nails, set aside. Crumble the almonds in a food processor and set aside. Blend the raisins together with the almond butter. Add the crumbled almond, the flaxseeds and the mix spices. Take a little amount of dough and press it in your hand as if closing a fist. Now you will have a deformed cylinder. Place it on a surface lined with baking paper. Give it a better shape by pressing with both your index and thumb of your two hands in order to shape a knuckle. Place a white almond on the edge of the finger to resemble a nail, press down gently. Take a butter knife and make three little wrinkles just after the nail and other three after the knuckle. Place the monster’s fingers in the fridge. Remember that they will hold their shape when you hold them only when cold, so serve them at the last minute. It is not a problem if they are laid on a plate, but they risk to crumble if not cold once you grab them! Now you can scare your guests! It’s nice to have healthy Halloween options as well with the proliferation of sweets this time of year. These look great–spooky and festive! Fantastic!!!!! Thank you so much for this yummy and healthy recipe! You are very welcome Alex! So glad you like them.